I hope you all had a fantastic easter weekend !The weather was surprisingly warm so instead of cleaning up my semi-abandoned garden I decided to escape from the traditional Easter duties, packed my bag with five chocolate bunnies and my tireless camera and headed to one of my favourite locations to shoot a few looks for you. In today’s post I want to introduce my readers to an online company that sell stunning statement jewellery – http://www.adorn-accessories.co.uk. These guys offer a fantastic selection of bracelets, ring, earrings and neckless which will appeal to the pickiest fashionista. When I received this beautiful statement necklace called Peppermint Party I knew straightaway that this chunky masterpiece would hold pride of place in my jewellery collection. I styled my look so that my new neckless would stand out – my glamorous green “Chanel “style jacket from Zara in combination with sun and leaves helped highlight the beauty of it resulting in a magic explosion of green! An ideal addition to the jacket is my holographic lips clutch by Henry Holland. It reminds me of Lulu Guinness iconic lips clutches but looks more funky. My limited edition Manchester Vogue Night Out t-shirt is from Harvey Nichols, you must have noticed from my previous posts my obsession with tee’s with slogans. Oh, and the heels.. These ones I got in Zara Madrid on sale for 10 euro ! Yep, 10 euro! Zara in Spain is a mecca for the local fashionistas, the product range is much wider there while the prices are cheaper, so unfair lol! I’m starting a ” fashion detox” after the #MCRFW weekend (you can check my dairy HERE ) so see you my lovely readers next week in my next post! I love your outfit !!! Your t shirt and jacket are perfect ! Soo good, love absolutely everything! wow! you look fantastic *_* love everything about this look, especially this jacket ! Gorgeous outfit! 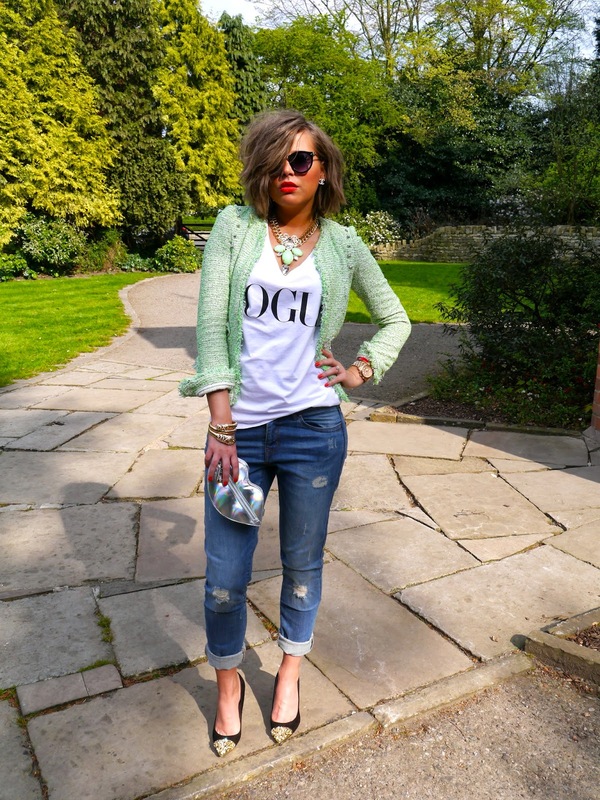 I have that tee from Vogue's night out and that blazer! Very stylish and edgy look from head to toe! Love the shredded jeans and the elegant jacket, nice clash of styles! I love this look, it's awesome ! Your necklace is to die for. You look amazing! Love your statement necklace and the color of your jacket! Gorgeous! You have such amazing style. great outfit! I love your jeans and your shoes! Love the way you accessorised the look with that stunning necklace and super cool lip bag! Girl. You are killing this look.